It's Facebook Fridays! for June 10, 2016, and this give-away is a walk on the wild side! The Lucky Mojo Curio Company is holding a random drawing to give away 11 luck-robbing, Jinx spiritual supply prizes designed to mess up an enemy's good fortune. 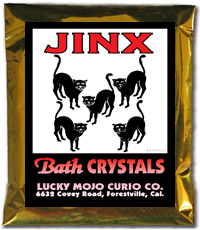 This week the prizes are 5 bottles of hand-made Lucky Mojo brand Jinx Dressing Oil, 3 packets of Jinx Bath Crystals, and 3 packets of Jinx Incense Powders. 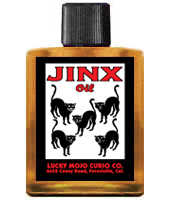 First thing tomorrow morning, we will select ELEVEN winners at random, announce their names here, and ask them to message this Facebook Page with their mailing addresses, so we can send them their FREE Jinx products. Be sure to go to Facebook and sign up, folks! We have a winner! In fact, we have 11 lucky winners! Our Facebook Fridays! winners for June 10, 2016 are: Miranda N. Prather, Catrena Hall, Jani Fulcher White, Williams Theophany, Milz Commodore, Diana Preskitt, TJ Evans, Jodi Lynn Connell, Brittany LoCurto, Jennifer Rose Ivey, and Dorene Rukse..